Summer has arrived and you know what that means: summer vacations, relaxing by the pool, sipping on Mojitos, flying over the Grand Canyon and taking in the glitz and glamour of the Las Vegas Strip… Anything and everything you want to do is available here in Las Vegas! 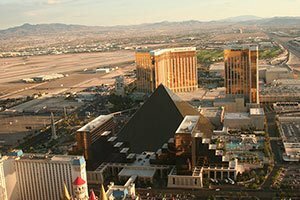 Las Vegas is a prime example of how modern technology and Mother Nature can truly walk hand in hand, offering visitors a little of each. In this month’s post, I will tell you about the West Rim of the Grand Canyon, where you can have the best of both worlds in one day! 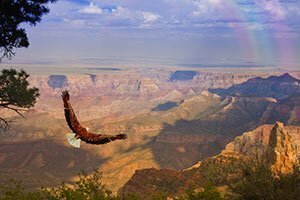 The West Rim is located on the Native American reservation, owned and operated by the Hualapai Nation. 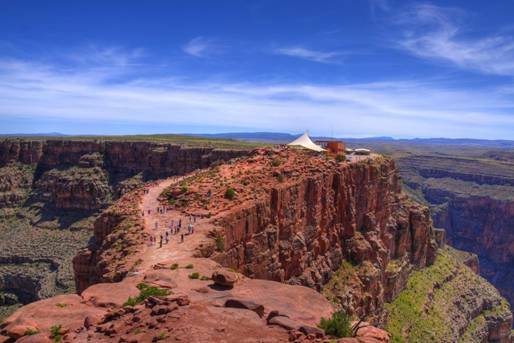 The West Rim is most famous for its natural landscape and the Skywalk (…more on that later). 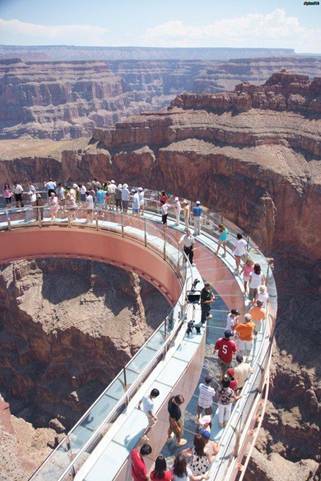 At the West Rim, visitors can walk right up to the rim and peer 4,000 feet down the canyon to the Colorado River. The West Rim, while not as wide as the South Rim, is still extremely impressive and the drop to the canyon floor is almost completely vertical. If you plan on driving out to the West Rim, please be advised that it is about a three hour drive, with the last ten miles are on a dirt road, so you will have to drive slowly. If you plan to fly out there with us via airplane or helicopter, it’s only about 35 minutes with views from above along the way. Now let’s get to the good stuff! 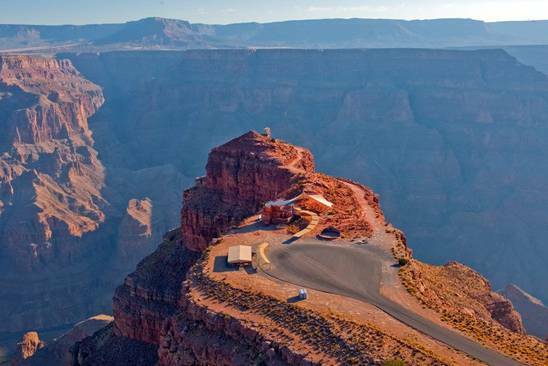 The two main viewpoints that are found at the West Rim are called Eagle Point and Guano Point. Eagle Point gets its name from the canyon formation that looks like an eagle spreading its wings. Oh, and this is where visitors will find the world famous Skywalk! 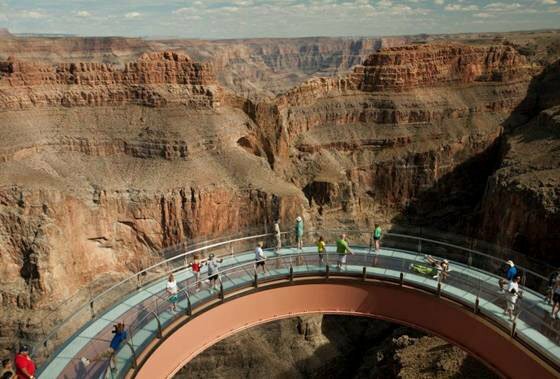 The Skywalk was built and completed in March of 2007, and has become a major attraction at the West Rim as there are not many places in the world where you walk 4,000 feet above land on a glass bridge. The horseshoe-shaped Skywalk allows visitors to “walk on air,” since the glass that you walk on is completely see-through, and let me tell you from experience, it is quite the rush, especially if you’re like me and afraid of heights! But I managed to walk the whole way and was happy to say that I actually did it. Here’s an insider tip: personal belongings, including your cameras, must be stored in the free lockers that are provided before entering the Skywalk, which means you won’t be able to take your own photos. There are photographers that will take your picture and you can purchase them in the Skywalk gift shop at the end of the experience. At Eagle Point, there are native Hualapai dancers and musicians who perform throughout the day. There is also a path that goes in a circle with numerous historical relics from other Southwest Native American tribes, with examples of their original as dwellings and fireplaces. It’s fascinating! The second viewpoint is called Guano Point. Guano literally means “bat droppings.” But don’t let that distract you from going there, you won’t find any bat droppings, trust me! Back in the late 1950’s, an old mine down towards the bottom of the canyon was discovered containing all kinds of bats and well, bat droppings. The folks back then realized that this “guano” would make an excellent fertilizer, and thus began an extraction effort of guano via cable cars that stretched across the West Rim. Though no longer in use, the relic of the cable car station can still be accessed here at Guano Point. 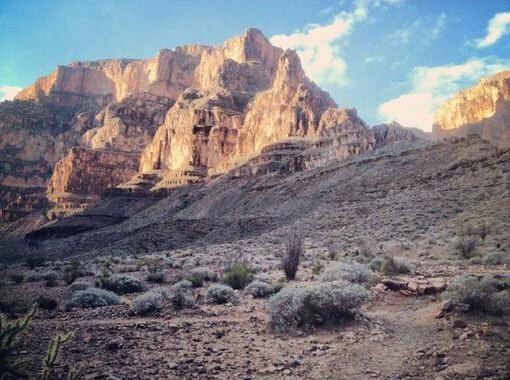 You’ll also find a circular rock formation that you can climb here at Guano Point, and once you get to the very top, you’ll find one of the most majestic 360 degree panoramic views of the West Rim of the Grand Canyon. The climb up this circular formation will require some effort, as there is no path, but it’s worth every step. Please be mindful of your step if you choose to climb! There is a café here as well that serves up a BBQ style lunch, and the view while dining is all outside, overlooking the canyon. We have two tours available here at the West Rim. 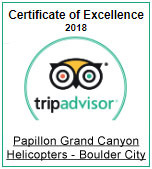 The Over the Edge Helicopter & Boat Tour takes visitors aboard our helicopter from the top of the canyon to the very bottom, where upon landing, visitors will board a smooth water pontoon boat operated by the Hualapai’s that goes up the Colorado River and gently drifts back down to the dock. 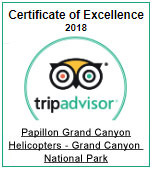 This is a perfect opportunity for those that want to get a unique view of the canyon and to see the scale of its grandness. It’s fascinating to see it from the very top and then from the very bottom – something not many are able to do! After the pontoon boat trip, you will board the helicopter once more to fly back up to the heliport. 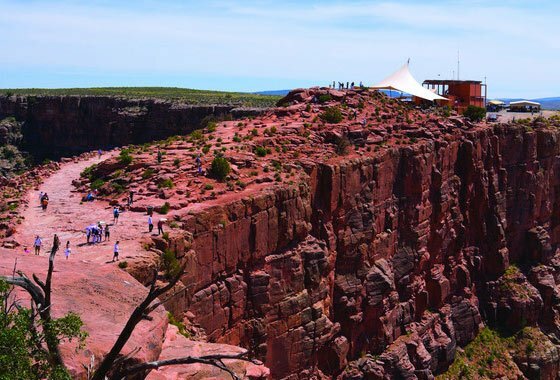 This tour also includes the West Rim entrance fee as well, so that way, you’ll be able to board the bus that takes you to the aforementioned viewpoints! The other tour is called the “Helicopter Up & Down Flight Only with Legacy Entrance.” (Insert link to tour here). 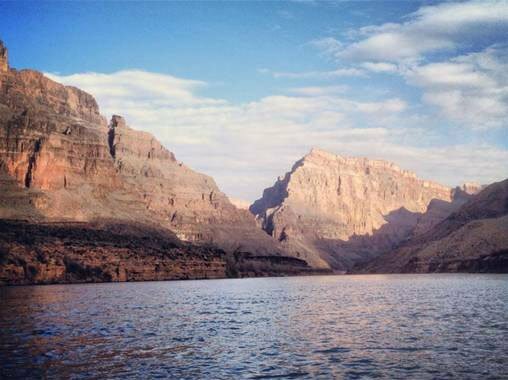 This tour is similar to the previous tour, but instead of boarding the pontoon boat, you will be given time to explore the base of the canyon on foot before boarding the helicopter again back up to the top of the rim. This tour also includes the West Rim (Legacy) fee, so you may hop on the bus to experience Eagle Point and Guano Point, as well! Good question! It’s ultimately a matter of preference and dependent on how much time you have to spend! 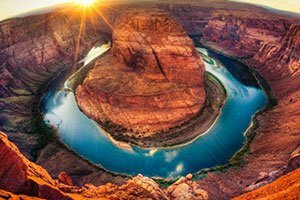 For those that have the time and the means of renting a car, you may drive out to the West Rim! It’s easy to get to from Vegas, and will take about 3 hours one-way. 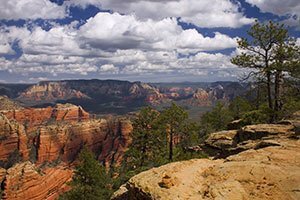 For those who don’t want to drive, there are motor coach bus tours that will take you and many others out to the West Rim! Now with the motor coach bus tours, they are approximately 12.5 hours roundtrip, from the time you are picked up to the time you are dropped off at your hotel. It’s a long day for sure, but this is one of the most popular ways of heading out to the canyon. 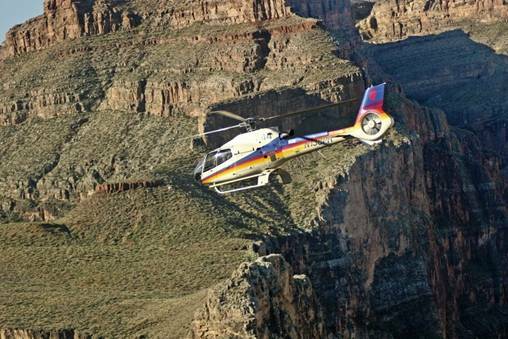 And lastly, of course we offer airplane and helicopter flights out to the canyon! 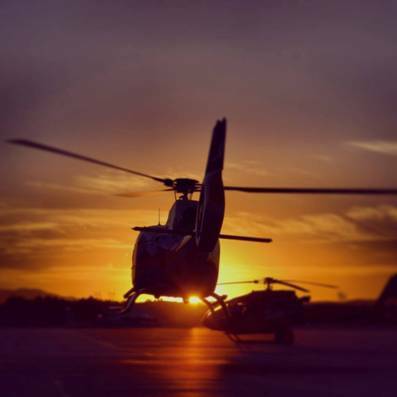 The flight time from Las Vegas or Boulder City is only about 35-40 minutes one way. Definitely the fastest and easiest way to get to the canyon! What type of weather should visitors expect? A. Summers here are the same as any desert, very hot. Clouds may occasionally roll in, but make sure to bring sunscreen, a hat, comfortable close-toed shoes, and plenty of water! Spring and Fall are much cooler, and can get a bit windy as well. Winters here are chilly, so make sure to bring a thick jacket and gloves! What kind of wildlife can be spotted at the West Rim? A. I’ve seen condors, owls, squirrels, mice, desert bighorn sheep, iguanas, geckos, tarantulas, scorpions, and once a year I see a seagull flying around. When I see that lone seagull, I wonder how it got here, but I’ve never bothered to ask. When’s the best time of year to visit? A. Spring or Fall. The weather during these seasons is the mildest. During Spring, you’re bound to see the desert around you blooming with wildflowers, and in the Fall, the temperatures are much cooler. How would you suggest getting out to the West Rim? A. Flying, for sure. Getting a bird’s eye view of the canyon is something that not many have the opportunity to do, and flying is much faster as well. If you’re flying from Las Vegas, it’ll only be about a 35 minute flight. If I only had time to visit one viewpoint, which one should I go to? A. It’s a matter of preference, honestly. Guano Point gives you a fantastic view of the Colorado River and you’ll have a chance to climb up the circular rock formation for 360	degree views. 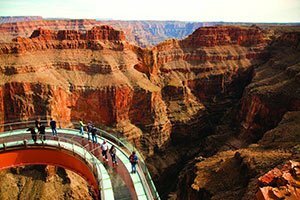 Eagle Point is fantastic, especially the rock formation that looks like an eagle spreading its wings, and for thrill seekers, we have the world famous Skywalk. Does it get crowded at the West Rim since it’s so close to Las Vegas? A. Weekends are slower, but a lot of people come here to see the Grand Canyon and this place isn't very big. How do you pronounce Hualapai? What’s the main difference in view and scenery between the West Rim and the South Rim? A. The South Rim is wider, with plenty of trees and wildlife. The viewpoints have guard rails and there are paved roads and sidewalks. The West Rim is more natural, more desert-like, with no guard rails at the viewpoints. You’ll still see wildlife here at the West Rim, but not as varied as the South Rim. Thank you for your time Mark and all the information! 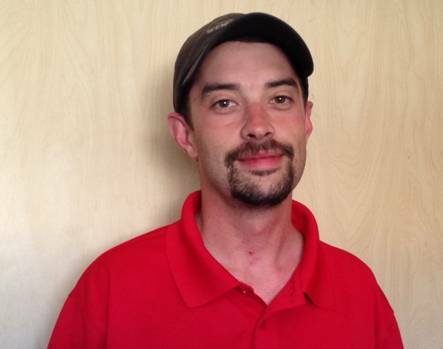 If you still have a few general questions that need to be answered, click here! Well, that’s all for now, check back regularly for the very latest!